Circumboreal species, from Alaska, across Canada and in Greenland. Clouberry grows in a wide variety of sites from wet to dry but dominates or co-dominates in peat bogs. “Cloudberry is shade tolerant. In the bog flats of southwestern Alaska, it was one of the first species to come in after dense sphagnum cover was established. 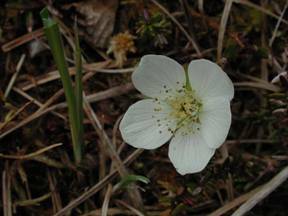 Cloudberry is an important component in the understory of mid- to late-seral northern woodlands.” (FEIS database)  Fire is also common in the shrub-tussock tundra, Clouberry resprouts after fire from rhizomes. 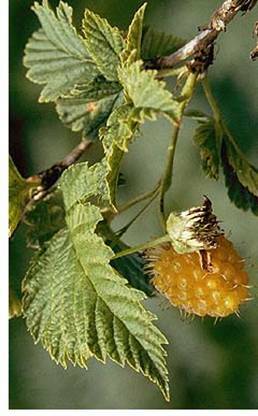 Cloudberry reproduces primarily by rhizomes. Recommended to not collect rhizomes since bogs are fragile, berries only. Remove flesh, store in cool dry place. Most successful proagation will be from one wild-collected plant, produce rhizomitously. Can be propagated by seed. Will grow best in Sphagnum. Saturated soil, sphagnum wetbed perhaps.